It took me quite a few years to get on the Ultima train. The series started in 1981, but it wasn't until the mid-'90s until I would discover Ultima Online -- the catalyst that allowed me to really embrace the franchise. But my enthusiasm would be short lived, as the departure of series creator and legendary game developer Richard Garriott would ensure a downward spiral for the once-great series for years to come. Now in 2013, EA is at it again, attempting to strike gold with Ultima Forever: Quest for the Avatar -- with a heavy emphasis on free-to-play mechanics, and in-app-purchases. 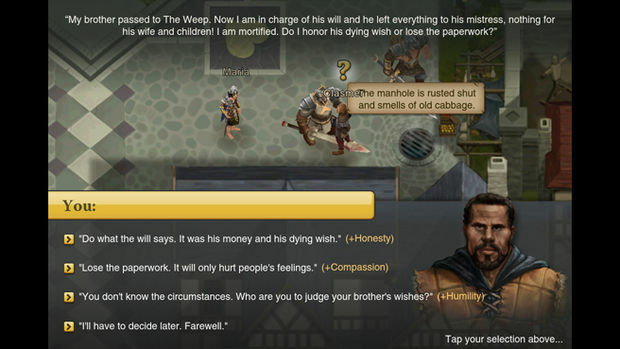 It's a shame though, as Ultima Forever is actually a pretty damn solid mobile RPG. Ultima Forever is a loose remake of Ultima IV, custom-tailored to touch devices. You'll be going up against the Black Weep, an all encompassing evil force that threatens to destroy the land of Britannia. 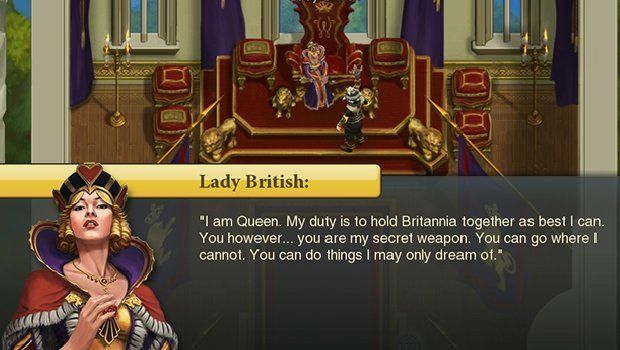 Lady British is in charge in Lord British's stead (funnily enough this is for no reason other than the fact that Ultima creator Richard Garriott has the rights to Lord British), and your job is to cleanse the land of evil. Basic, yes, but it works, and the actual world itself is just as fun as it was in the classic sense, and there's tons of variety to be found within its borders. There's a basic "virtue" system that involves various moral choices as well, and it's neither poor or groundbreaking -- it kind of just middles somewhere in-between. It really helps that the artwork is gorgeous all around, and helps accentuate the average in-game graphics. Everything is controlled by tapping on the screen, with no clunky virtual sticks to speak of. If you want to strike an enemy or use an ability -- simply tap it. If you want to dig into your equipment and statline -- just tap through some menus. You'll be able to choose between the Fighter and Mage class at the beginning, which basically translates to "melee or ranged" capabilities. Either way I had a ton of fun just wandering around the countryside, as this is easily one of the most intuitive dungeon crawlers on the mobile platform. 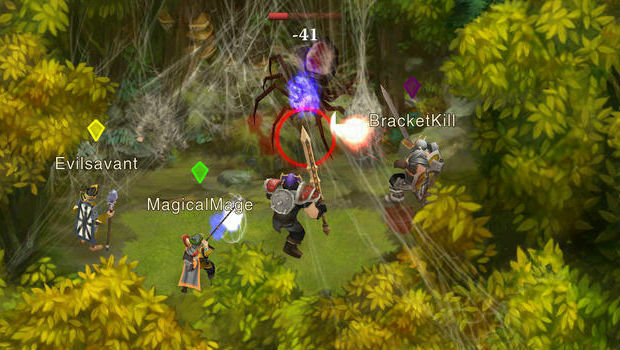 There is a multiplayer aspect involved, and it's extremely easy to get into. All you have to do is stay outside of a dungeon, click the find group button, and wait. Given the fact that it's a free game on iOS with a big name attached to it, there's tons of people waiting at all times to indulge your dungeon-crawling habits. But while the system itself works in theory, I encountered a number of bugs that either dropped other players without warning, crashed my game, or lagged players so badly that they were floating around inside of walls. If you're kicked out of a party, the game doesn't start its own instance either -- so you lose all your current progress in that particular area. Thankfully, the game can be most played solo without issues -- at least, until you start tangling with microtransactions. This is how the IAP system works. Basically, there are three sets of keys as currency: bronze, silver, and gold. During normal gameplay, it's fairly easy to pick up a decent amount of bronze keys, along with a few silver ones. But here's the issue -- in order to open even basic chests, or repair items, you need to use bronze or silver keys. This creates a perpetual rat race of grinding, as you'll often times find yourself using too many keys for new items, and too many keys to repair your old items, which you're using to get new items. Fast travel is also tied to using bronze keys. The solution is to keep grinding, or give in and buy keys. Gold keys are another issue entirely. If you want gold chest items, you have to use the appropriate keys. In theory, that could be completely fine if they want to monetize the game that way, as gold keys can be earned very slowly without buying them. But for some reason, someone decided it would be a good idea to paywall off extra ability slots at 25, 75, and 200 gold keys respectively. You can also buy more buffs and heal yourself with gold keys. The current rate for gold keys piecemeal is $10 for 70 -- unless you're willing to shell out over $20 for a package deal, you do the math. It's not very fun to avoid opening up a chest for new items because you're afraid of exhausting your repair currency -- which is basically the exact kind of trap the IAP system wants you to fall in. At this juncture, I'm not sure how Mythic could make the game more appealing given these issues. I don't think eliminating microtransactions entirely is an option for them -- but sincerely, I wish it was, because this will eventually destroy the game's community, and create ghost towns over the next few months. Beyond the bugs and pesky purchases, Ultima Forever is actually a pretty solid touch RPG. The controls work far better than you'd expect, and there's a ton of content to explore. It's also really, really simple to jump into a dungeon or two if you have some free time and grab a few friends along the way. That setup is exactly the way mobile games should operate -- but unfortunately Ultima Forever forgoes a fair premium price in favor of greedy microtransactions.